The purpose of education is to teach the reader Clock preschool children recognize the clock and realize the form of a pointer-hour digital clock. The game is designed for 1-6 children aged 5 to 8 years under the guidance of parents or teachers. 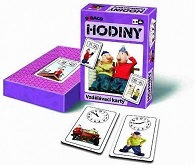 The game contains 16 cards with pointer hour, 16 cards with digital clock and instruction.